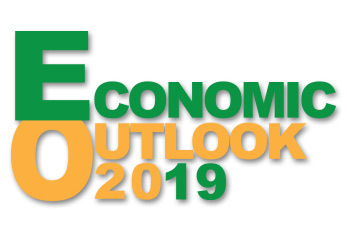 The Carroll County Department of Economic Development held its 2019 Annual Economic Outlook seminar on Tuesday, April 2nd at Martin’s Caterers – Westminster. The seminar, sponsored by BB&T, was attended by nearly 300 local business people, government officials and educators. This year’s presentation title “To All the Economists I’ve Loved” is derived from the 1984 Country/Pop hit “To All the Girls I’ve Loved Before” recorded as a duet featuring Willie Nelson and Julio Iglesias. Including quotes from classic economists such as Milton Friedman and John Maynard Keynes, the presentation was again delivered by Anirban Basu, Chairman & CEO of Sage Policy Group, Inc. Mr. Basu, a regional economist, Chairman of the Maryland Economic Development Commission and noted lecturer. He provided a review of the economy from an international, national, Maryland, and Carroll County perspective. Jack Lyburn, Director of Economic Development, kicked off the event and shared some Carroll industrial highlights featuring 5 current projects that represent a total capital investment of $192,000,000 with new building construction of nearly 400,000 square feet. Mr. Basu’s presentation is available below in PDF format.